Harrogate Town have been drawn at home to in-form Stockport County in the third round of the FA Trophy. 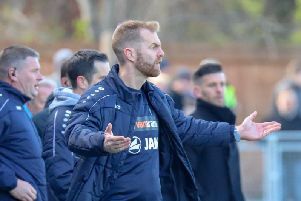 Simon Weaver's men will entertain the National League North title-chasers on Saturday, February 2 having overcome Dover Athletic at the weekend. "We're at home which is what we really wanted and although this is by no means an easy draw, the game is one we're all really looking forward to," the Town boss said. "It will be tough. Stockport are in great form and their manager Jim Gannon has done a fantastic job there. They're up their challenging at the top of National League North with a team full of experienced players. "Everything maybe went right for us when we played them here last season [and won 4-1] and I think they're a stronger side now than they were then. "I'm sure they'll bring a big following as well given that they normally attract around about 1,000 more fans than anyone else in their division, so that should make for a great atmosphere as well as providing us with a nice financial boost." Stockport thrashed National League South outfit Truro City 5-0 in the second round of the competition to set up next month's meeting with Town. That victory was their fifth in succession and eighth in their last nine outings. They are currently unbeaten in 10 matches, a run that has seen them climb to third place in the National League North standings. Town were due to host Bromley in the National League on February 2, but that fixture will be now be re-arranged.